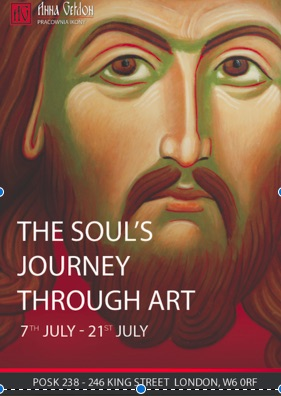 The Soul’s Journey Through Art – A beautiful exhibition of icons painted by the Krakow Icon School has opened at the Polish Cultural Centre (POSK) in Hammersemith, west London. The show includes several images of Christ Pantocrator and Our Lady, as well as some more unusual images – among the Jonah and the Whale, and one of the Desert Saints, perched on a high pedestal. Anna Gelbon, founder of this Polish icon painting school. She herself is an artist, art historian, as well as professional icon painter. Teaching icon painting over the years, she observes with both interest and joy, that not only do students improve their artistic skills but that they also develop their inner lives. She has come to the conclusion that icon painting opens the way to a contemplative spiritual journey. During the private view on Friday, the celebrated young Polish baritone Lukasz Hajduczenia accompanied by Dimitri Tugarinou sang some haunting ancient Orthodox hymns and chants. The school runs courses at the Orthodox Church in Krakow during term time and also organises summer and winter icon painting retreats in the ancient monastery of Suprasl, in eastern Poland. There is also in introductory workshop planned at POSK.